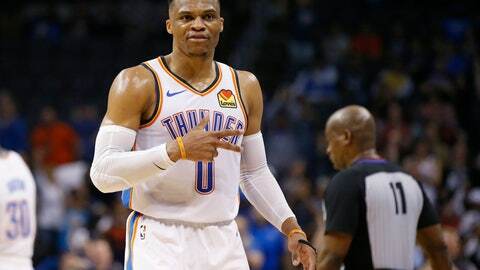 OKLAHOMA CITY (AP) — Russell Westbrook became just the second player in NBA history to have 20 points, 20 rebounds and 20 assists in a game as the Oklahoma City Thunder defeated the Los Angeles Lakers 119-103 Tuesday night. Kentavious Caldwell-Pope led the Lakers with 23 points. OAKLAND, Calif. (AP) — Kevin Durant emphatically showed who is still No. 1 in the West, delivering a pair of jarring dunks late in the first half and finishing with 21 points and six assists before being ejected to lead the Golden State past Denver in a matchup of the top teams in the conference. DeMarcus Cousins had a season-best 28 points, on 12-for-17 shooting, 13 rebounds, five assists and two blocks for the Warriors (53-24), who have a two-game lead and the tiebreaker on Denver (51-26) with five games to go in the chase for the Western Conference’s top seed and home-court advantage throughout the playoffs. Stephen Curry added 17 points, five rebounds and five assists. Jamal Murray scored 17 points, and Paul Millsap had 11 points shooting 4 of 11 for Denver, which lost for the third time in four games and played the first night of a tough back-to-back with San Antonio visiting the Mile High City on Wednesday. SAN ANTONIO (AP) — DeMar DeRozan scored 29 points and San Antonio beat Atlanta for the 21st straight time at home. San Antonio point guard Derrick White added 23 points after scoring 12 total points in his previous two games. The Spurs remain seventh in the Western Conference at 45-33. Atlanta led by as many as nine points in the second half, before San Antonio rallied in the fourth to avoid its second straight loss at home. Kent Bazemore had 26 points to lead the Hawks, and Alex Len added 21. SACRAMENTO, Calif. (AP) — James Harden had 36 points and 10 assists and Houston matched its season high with 26 3-pointers in a win over Sacramento. Eric Gordon and Danuel House Jr. each scored 19 points, Kenneth Faried added 12 points and 11 rebounds, and P.J. Tucker scored 13. The Rockets have won 17 of 20. Houston (50-28) moved a half-game ahead of idle Portland for third place in the Western Conference. It’s the fifth time in the six years that the Rockets have had at least 50 victories. Buddy Hield had 20 points and seven rebounds for Sacramento. The Kings (38-40) have lost four of six.